The Secretary of the Army (SA, SECARM or SECARMY) is a senior civilian official within the Department of Defense of the United States with statutory responsibility for all matters relating to the United States Army: manpower, personnel, reserve affairs, installations, environmental issues, weapons systems and equipment acquisition, communications, and financial management. Prior military service is not a requirement, but quite a few have served in the United States armed forces. Secretary Stone is the only holder to serve in the military outside of the United States. The Secretary of the Army is nominated by the President and confirmed by the U.S. Senate. The Secretary is a non-Cabinet level official serving under the Secretary of Defense. This position was created on September 18, 1947, replacing the Secretary of War, when the Department of War was split into the Department of the Army and Department of the Air Force. On November 15, 2017, Mark Esper was confirmed as the Secretary of the Army, and was sworn in to office on November 20, 2017. The Senior Leadership of the Department of the Army consists of two civilians—the Secretary of the Army and the Under Secretary of the Army—and two military officers of four-star rank—the Chief of Staff of the Army and the Vice Chief of Staff of the Army. The Secretary of the Army (10 U.S.C. § 3013) is in effect the chief executive officer of the Department of the Army, and the Chief of Staff of the Army works directly for the Secretary of the Army. The Secretary presents and justifies Army policies, plans, programs, and budgets to the Secretary of Defense, other executive branch officials, and to the Congressional Defense Committees. The Secretary also communicates Army policies, plans, programs, capabilities, and accomplishments to the public. As necessary, the Secretary convenes meetings with the senior leadership of the Army to debate issues, provide direction, and seek advice. The Secretary is a member of the Defense Acquisition Board. The Secretary of the Army has several responsibilities under the Uniform Code of Military Justice, including the authority to convene general courts-martial. Other duties include management of the Civilian Aides to the Secretary of the Army Program. 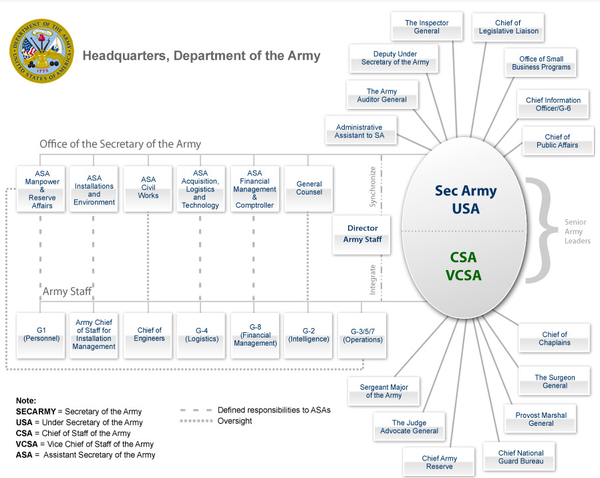 The Office of the Secretary of the Army is composed of the Under Secretary of the Army, the Assistant Secretaries of the Army, the Administrative Assistant to the Secretary of the Army, the General Counsel of the Department of the Army, the Inspector General of the Army, the Chief of Legislative Liaison, and the Army Reserve Forces Policy Committee. Other offices may be established by law or by the Secretary of the Army. No more than 1,865 officers of the Army on the active-duty list may be assigned or detailed to permanent duty in the Office of the Secretary of the Army and on the Army Staff. Kenneth Claiborne Royall, the last Secretary of War, became the first Secretary of the Army when the National Defense Act of 1947 took effect. Gordon Gray was the last Army secretary to hold the cabinet status, which was henceforth assigned to the Secretary of Defense. ^ http://www.apd.army.mil/pdffiles/r840_10.pdf Archived June 7, 2010, at the Wayback Machine, accessed on January 4, 2012. ^ a b "Secretary of the Army". U.S. Army. Retrieved November 21, 2017. ^ "SECARM sets goals, timeline for Rapid Capabilities Office: AUSA exclusive". defensenews.com. October 3, 2016. Retrieved January 19, 2018. ^ "US CODE: Title 10,3013. Secretary of the Army". Retrieved September 22, 2007. ^ a b Bell, William Gardner (1992). ""Kenneth Claiborne Royall"". Secretaries of War and Secretaries of the Army: Portraits and Biographical Sketches. United States Army Center of Military History. Retrieved September 22, 2007. ^ "Secretary of the Army". Archived from the original on September 21, 2007. Retrieved September 22, 2007. ^ "US CODE: Title 10,3014. Office of the Secretary of the Army". Retrieved September 22, 2007. ^ Bell, William Gardner. ""Intro - Secretaries of War & Secretaries of the Army"". Secretaries of War and Secretaries of the Army: Portraits & Biographical Sketches. Retrieved September 22, 2007. ^ a b c d e f * Bell, William Gardner (1992). Secretaries of War and Secretaries of the Army: Portraits and Biographical Sketches. Washington, D.C.: United States Army Center of Military History.